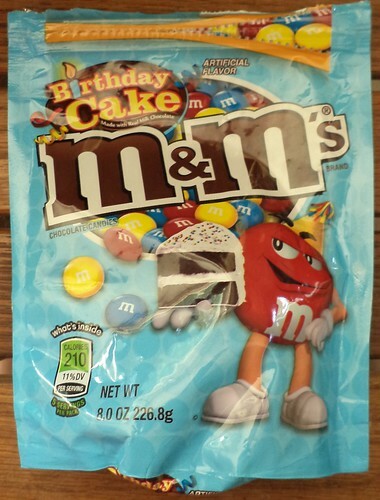 And a different flavor of M&M's is released to the public. My friend, Meredith, sent me a bag. I have been giving it the "all-American" try and here is my report. Meredith said her kids really like these. I, on the other hand, have found it extremely difficult to sit down and eat more hand a couple handfuls at a time. First of all, the colors of red, blue and yellow are not appealing. I don't quite know why I find the whole image boring, but I do. Birthday cakes aren't just red, blue and yellow. They are white and orange and green and pink. Usually, I'll dump out a bunch of M&M's and eat one color first, one color second, you know what I'm talking about. With these, I just dump out a few, eat those up and reseal the bag. Second, that eat and close maneuver is because these aren't very good. The impression after eating one M&M is that it's quite sweet. I don't like the excessive sweetness. You know, the more I think about this, the more I think that, for me, birthday cake is not about the flavor. Birthday cake is about the cake part. And, anymore, birthday cakes can be cheesecakes, brownies, sundaes, cookies, etc. I think that's what I miss in a candy that is flavored like a birthday cake, texture. So, once I finish this bag, I won't be getting another, not even if it's on sale for a dollar. I kind of wish they would just stick with what flavors they have or make the cherry ones available all year 'round. I still have 2 bags of those on top of the fridge. I'm saving those for emergencies.